Brisbane Airport’s new 5-star Pullman Hotel and 3.5-star Ibis Hotel have now topped-out with interior fitting commencing on both the hotel buildings and the adjoining 300-seat conference centre. Brisbane Airport has its sights on becoming a major inbound transit hub. According to Flight Global, 20% of Brisbane’s inbound passenger traffic last year was in transit. “We definitely have lots of space to grow… the sky’s the limit on our transit traffic target,” said BAC’s Andrew Brodie. Brisbane Airport Corporation managing director Julieanne Alroe said BAC were unashamedly positioning the city as the nation’s preferred international entry point. The $150 million hotel development project increases the number of airport hotels in Brisbane to three and would stand to capitalise on high international passenger growth which is projected at 7% for the 2017 financial year. Danesh Bamji, General Manager of Franchise for AccorHotels Australia said, “Tourism is undeniably one of Australia’s top industries with recent figures showing the sector has grown at four times the rate of the Australian economy. It is critical to have accommodation options in airport precincts and to that we’re thrilled to be working with owners, Anthony Flynn of Flynn Property Group and Scott Flynn of Scott Flynn Properties to bring 5-star hospitality to people travelling into Brisbane. The completion of Brisbane Airport’s $1.35 billion New Parallel Runway (NPR), now just three years away will give Brisbane Airport equal capacity to Hong Kong and Singapore airports, with BAC claiming once completed it would have the best runway system in Australia. 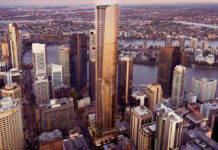 Lord Mayor Graham Quirk said Brisbane’s $6.3 billion international and domestic tourism industry was continuing to grow and this $150 million investment represented an important addition to the city’s hotel and conference facilities supply. 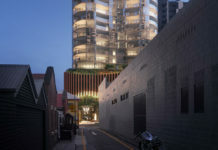 “Just three years ago the city was forgoing 120,000 visitors a year and was being overlooked for major events opportunities due to a lack of hotel rooms, however, hotels such as the Pullman Brisbane Airport and ibis Brisbane Airport hotels will help address this shortage and allow the city to attract world-class events,” Cr Quirk said. A freeform leisure pool with a 20 metre lap pool, poolside daybeds and pergolas will be available for guests relaxing in transit or waiting for a flight. 243 rooms including 99 Superior rooms. The project is expected to create 1000 jobs during the construction phase, and employ between 300 to 350 people ongoing at the Pullman and ibis hotels when open. Meanwhile Brisbane Airport last week welcomed the arrival of Malindo Air which has started Brisbane to Kuala Lumpur flights via Bali. The new flights will add more than 130,000 seats annually between Queensland and Malaysia, providing connections to 40 other international destinations on Malindo Air’s extended flight network. Malindo Air is the 30th airline now flying to Brisbane Airport. Sci-Fleet Motors Pty Ltd has announced they have secured a prime gateway site in the new $300 million auto mall precinct. John Tormey, BAC’s General Manager Commercial Businesses said Sci-Fleet who are the largest dealer for the Toyota and Lexus brands would join the first stage of the project. “Having commenced commercial negotiations with many of the leading automotive groups who have previously expressed interest in the project in the latter part of 2016, we are pleased with the level of interest in the BNE Auto Mall that continues to build each month. 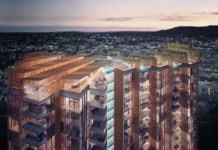 We are well progressed with a number of groups and expect to make further such announcements in the coming months,” JLL’s negotiator Ben Koop said.